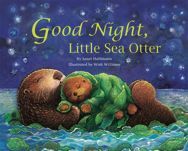 Good Night, Little Sea Otter by Janet Halfmann, illustrated by Wish Williams. Star Bright Books, New York, NY, 2010. “As the setting sun kissed the kelp forest, Little Sea Otter snuggled on Mama’s chest. Mama fluffed his fur until he looked like a brown powder puff.” It’s time for bed, but Little Sea Otter has other ideas. He has forgotten to say goodnight to a variety of other sea creatures. Just like a human child, he tries to put off bedtime. Halfmann’s musical prose is so perfect that adults will have no reluctance reading and re-reading this delightful picture book. Little Sea Otter waves his “soft, silky paw” and dips his “furry face into the chilly water.” Fish “bubble and burble.” Mama finally wraps up baby sea otter, much like a human Mama would do. And the little otter, much a like a human toddler would do, finds just one more creature to say goodnight to before nodding off. Wish William’s illustrations depict the mother/child relationship so perfectly the reader will forget these are otters and not humans. This is the perfect quiet book to read at bedtime, when settling down into the child’s own comforting snuggle place. Thanks so much for the wonderful review. I appreciate it so much.